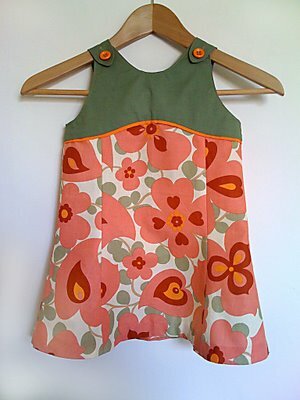 Let’s say you find a print you really love, but you’re a little nervous about using it for a child’s garment. Maybe it’s a large, bold print. Maybe it’s very bright or multi-colored. Maybe it’s both. You’re afraid that by using the print you’ll break the first of our principles of fabric selection–see the child before the outfit. You don’t necessarily need to shy away from bright, bold prints. You just need to be sure you don’t overdo it. 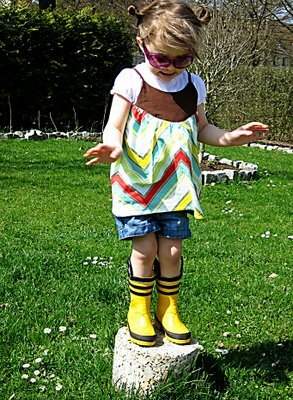 One way to do this is to ground them with coordinating solids or neutrals. It’s very much the same reason that blue jeans go with everything. They’re neutral, and they’re an excellent base from which to start building an outfit. This is an easy principle that many people instinctively follow. There are many more excellent examples of this in the Oliver + S Flickr group. By selecting a solid color that ties back to the print, this dress looks beautifully coordinated without being too busy or bold. 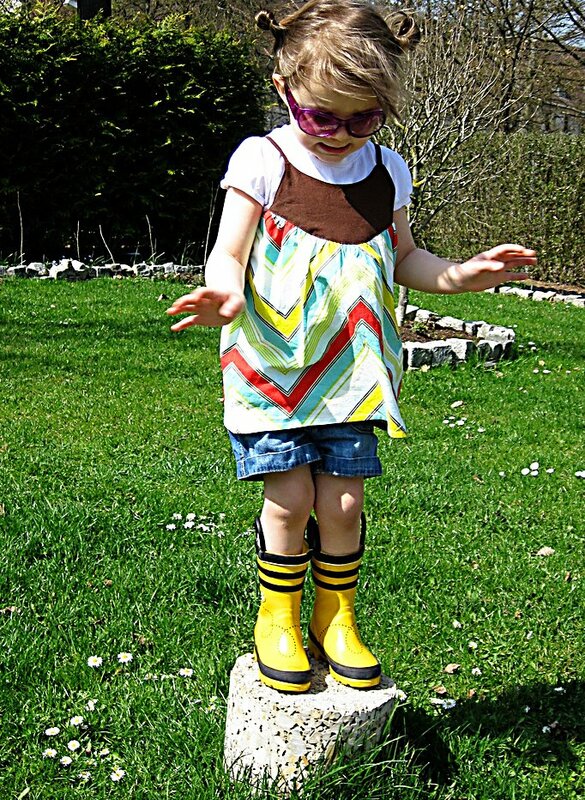 A solid brown yoke helps to tone down this over-sized and colorful zigzag print on the Swingset Tunic. By grounding the bold print with the neutral solid, the creator of this garment has taken a very busy, potentially overwhelming, print and made it perfectly appropriate for a child’s top. Notice how this seamstress has paired a large Amy Butler floral print with a dark solid. 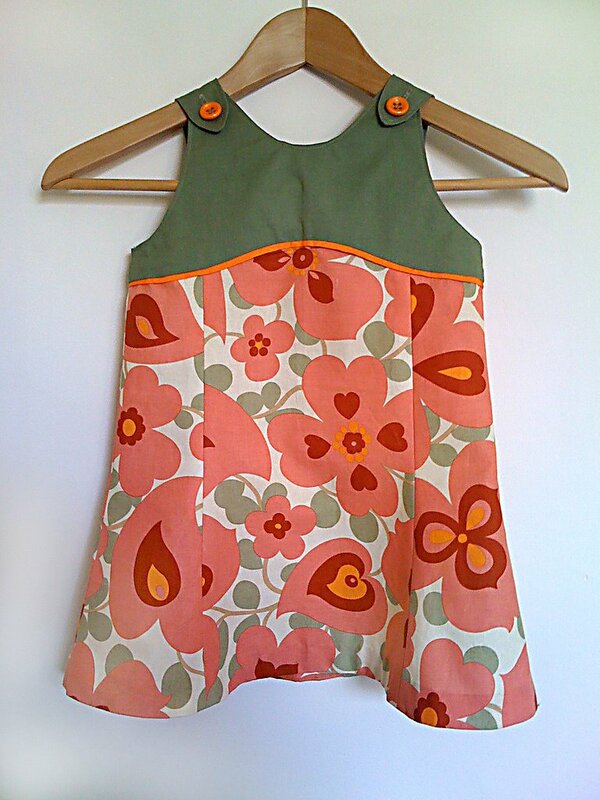 I especially like how the yoke of this dress picks up the neutral tones in the print. A solid pink yoke would have been too much for this dress, but the neutral color makes it look especially elegant and sophisticated. These three garments teach a good lesson. You don’t need to be afraid of bold, bright prints and colors. You just need to be careful about not overusing them. And if you do decide to use one, make sure to ground it with a neutral or a solid. I am enjoying and learning from this series of yours, thanks! In all of the examples you've chosen, the solid is at the top and the print is on the bottom. Do you think it's necessary to separate the print from the face with a solid, or can it work with the print on the bodice and a solid skirt? Just finished a baby quilt using rail fence blocks. Each print was paired with one or two neutral Japanese wovens. The effect was fantastic (but of course I am biased). First time I had tried it, and of course it proves you right! 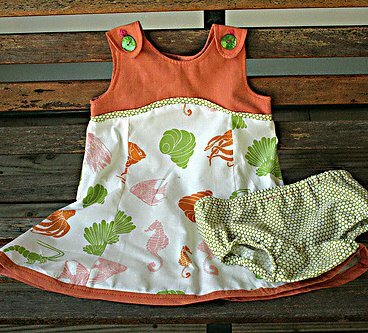 Oh my goodness I made that last dress, I have a big grin on my face. ohhhh wow! I made the middle top! Thank you for "featuring" me! I love your patterns and LOVE that you talk about fabric choices!